Ah, the day has finally come! It’s time to bring your new gorgeous patio set outside and unveil it to the world. No doubt you’re already garnering jealous looks from your neighbours and dealing with friends trying to invite themselves over to experience your set. This is all just part of the fun of being a patio set owner. You (and your new patio set) are the belle of the ball. Whether you’re planning on eating a delicious brunch and gossiping about a friend of a friend, or treating your friends to the best dinner party your town has ever seen by putting your grandmother’s china out on your furniture underneath the stars, there are very few drawbacks to being one of the elite few who possess outdoor patio furniture, and you should revel in that fact. However, don’t get too secure in your ownership! You must protect your patio furniture from the insidious forces of nature that will wear away its sheen and gloss and turn it into a much less regal display. You may think you’re covered from wind, rain, snow, and sleet – but have you considered the sun? The Sun Can Damage Furniture? The sun is absolutely able to damage your patio furniture. It’s simple: if the UV rays of the sun can damage a human who stays out too long in the sun, causing all sorts of nasty problems down the line like skin cancer, sunburn, and weaknesses and defects in the skin, then it is absolutely able to do the same to a piece of furniture which rests in the sun all day long every day until the first frosts of the fall finally come. The sun is a deadly force to outdoor patio furniture, partly because no one expects it to end up causing so much damage, and thus they fail to prepare adequately. When it comes to the sun, you must be careful to avoid this path of not realizing the damage it can wreak. Your furniture can structurally weaken, suffer damage to the surface which makes it unsightly, and the upholstery can even suffer damage that turn a relaxing sit to a lumpy, bumpy mess. 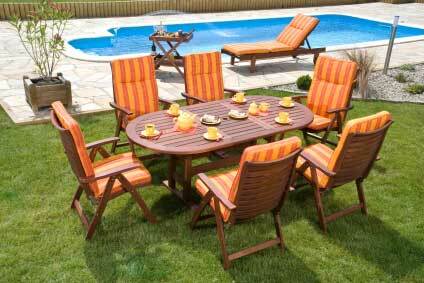 Don’t underestimate the power of UV rays, and take the preparations you need to protect your patio set from the sun. You wear sunscreen when you go out on the beach, so give your patio furniture the same level of consideration – after all, it’s worth the effort when you save money on replacements or repairs. First of all, the sun projects UV rays. These UV rays, as previously mentioned, wear away at the material of the outdoor patio furniture. The damage can be both to the surface of the pieces in the form of aesthetic blemishes, fading, and so on, and also to the inner structure of the furniture, causing structural weaknesses that can come back to bite you in the behind down the road. The ambient temperature in the background can also cause issues. Just as wind or rain causes erosion, a sufficiently high (or low) temperature is not healthy for furniture to be exposed to 24/7. The sun is also a major force that causes humidity in certain climates. The humidity invades your furniture, making upholstery that was once comfortable to recline on a much less enticing prospect. Combined, these two forces cause major damage to furniture, especially furniture that’s left out all summer long while the hostess or host entertains guests or goes about their daily life. With most patio furniture, the fact that it’s so difficult to transport around on a regular basis means that simply tucking the furniture away in a shed or garage doesn’t work. A canvas tarp is also a less than ideal solution, as even though UV rays are blocked, temperature and humidity still are allowed to work their insidious magic. In addition, an unsightly. canvas tarp goes against the aesthetically pleasing purpose of patio nature. First of all, keep your outdoor patio furniture outdoors only when its seasonal. Just like a Christmas tree, sometimes the season passes and the furniture has outstayed its welcome. In this case, the solution is simple – only wait until the times of the year when people wish to be outside to enjoy drink, food, and company. If you live in an area where the heat becomes exceedingly uncomfortable for a month at a time, consider putting the patio furniture away. Similarly, if you live in an area where summer is a brief glimpse, be ready to remove the patio furniture when the cold fall begins. Secondly, use protective accessories. For one thing, an umbrella is a great way to shield both your guests and the furniture from the harmful rays of the sun. Another solution is a protective spray that can be purchased at major hardware stores and even larger retailers like Wal-Mart. Be sure that your solution matches the material of its furniture – for instance, don’t use wood spray on a metal frame. This causes a chemical imbalance that means the results won’t turn out as you hoped. Following these tips should lead to a much less destructive summer, extending the life of your furniture and also keeping you wallet as fat as possible. When it comes to protecting your outdoor patio furniture, you don’t have to panic. When you take the proper precautions and use the solutions offered above, the amount of damage minimized by the sun should be minimal. With these tips under your belt, the uphill battle becomes much more manageable. You can spend your summer focused on whats important – enjoying your furniture, not letting it rule your life.